April is National Poetry Month in the United States. 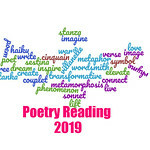 Even though I think people should read poetry every day or at least more often than once per month, April has been the focal point for poetry activities since National Poetry Month was created by the Academy of American Poets in 1996. It’s hard to believe the event has been happening for 20 years. This year, I’m hoping that I can get some wonderful blogs to participate in the 2016 blog tour for poetry. I would love to get some great new interviews, reviews, poetry readings, innovative poetry activities, and some visual artists interested in sharing some poetic renderings. If you’re interested in signing up for the tour, feel free to leave a link in the Linky and comment about what you want to host in April. Stop back here in April for some fun interactive poetry activities. Here’s your 2016 NPM Blog Tour Button! Hi Serena. Like Tabatha, I’m not sure what I’ll be posting yet, but I am happy to be part of your tour on 4/22. Today’s Little Ditty is the name of my children’s poetry blog. All I know is it probably won’t be an interview since I have an extensive interview with a children’s poet on the first Friday of every month. On 4/1 I am interviewing Marilyn Singer. Hey Serena! I will be posting something poetry related every Friday this month. I’m focusing on poetry for April. Our university has a reading with Andrea Hollander on April 11th. I could do a write up about that. I would prefer to write on a Thursday or Sunday (perhaps the 14th or 17th) as that is when I tend to focus on reviews/poetry. Hi and thanks for joining the blog tour! April 14th is all yours! I love this idea Serena! Please count me in. I’m not sure what I’ll write about whether it’s a poetry collection or two or something else related to poetry. I can do a post either the third or fourth week in April. I can really do any days except Mondays and Tuesdays so just give me whatever fits your schedule best. I think I would like to write about how poetry helped me find my creativity when I was in high school. Would that be appropriate for this event? I’m so glad that you’ve been reading more poetry. If you want to do another post for the blog tour for National Poetry Month, let me know. But you can count The Jane and Bertha in Me review if you want. I’d like to go on April 19. Not sure of the poet yet, but I’ll feature either an entire volume or discuss a poem in depth.